Three experts agree that millennials winning at life in terms of career success involves taking the lead and thinking like a boss, according to an article released by Self in May 2016. Meredith Bryan broaches three skills in “Take the Lead: A Step-by-Step Guide to Thinking #Like A Boss, Whether You’re in Charge Now or Will Be Soon.” The Brooklyn-based author, a Dartmouth College graduate in English and a freelance editor and writer since 2007, correlates survey results released in 2015 with expert observations. Brooklyn-based writer Meredith Bryan's article on millennial leadership skills appears in the May 2016 issue of Self magazine. Fifty-one and 66 percent of survey participants imply thinking like a boss by respectively claiming as theirs the most important leadership skills of communication and relationship-building. Thirty-nine and 50 percent of Millennial Leadership Study participants respectively judge career advancement opportunities jeopardized by intra-company trends toward inadequate communication and toward insufficient leadership development. 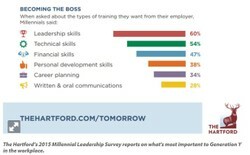 Infographic from The Hartford's 2015 Millennial Leadership Survey presents training priorities identified by millennials. A reluctance to conform and a tendency to question process keep millennials from accepting precedent as a reason for how and why to get things done. Information-sharing offers optimum impacts when leaders hold regular team and special one-on-one meetings, keep office doors open, and recognize team members by face, name and responsibility. Branding expert Dan Schawbel provides insights to millennials for self promotion as indispensable contributors in their careers. 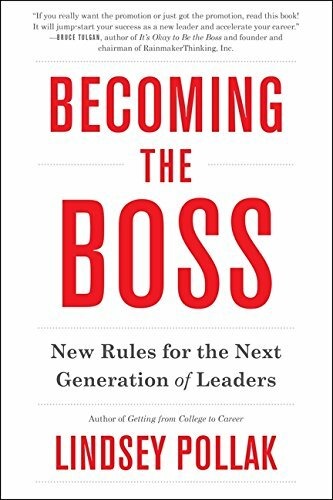 Lindsey Pollak, author of Becoming the Boss, recognizes top leadership skills, for information-sharing and team-building, in the union of being oneself yet being open to improvement. She states that “This generation is more supportive toward different types of leadership” since executive-coaching and mentoring overcome reluctance to deliver bad news or speak publicly. Meredith Bryan thinks that all three top leadership skills contribute to “honing an effective and individual leadership style” for collaborative yet individualistic, passionate yet purposeful millennials. Millennial workplace expert Lindsey Pollak shows millennials how to step into targeted positions as executives. Millennial entrepreneur Whitney Wolfe shares in Meredith Bryan's millennial leadership skills article that "You can't lead with fear." Whitney explains that "Results are better when people feel encouraged." Bryan, Meredith. May 2016. “Take the Lead.” Self. New York, NY: Condé Nast. “The Millennial Leadership Survey.” Workplace Trends > Media Room > July 20, 2015. Pollak, Lindsey. 2014. Becoming the Boss: New Rules for the Next Generation of Leaders. New York, NY: HarperCollins. Schawbel, Dan. 2015. 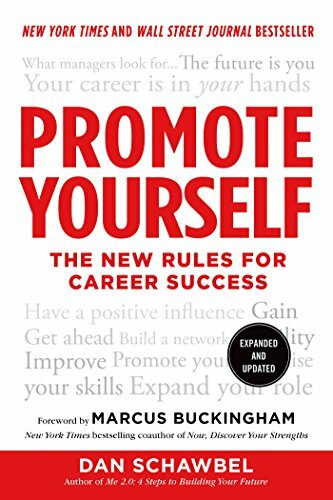 Promote Yourself: The New Rules for Career Success. New York, NY: St. Martin’s Press paperback. May 2016 issue includes millennial-themed article, "Take the Lead: A Step-by-Step Guide to Thinking #Like A Boss, Whether You’re in Charge Now or Will Be Soon," by Brooklyn-based author and Dartmouth College graduate, Meredith Bryan. katiem2, Thank you for the update and congratulations on your daughter's achievements and happiness. You could just as easily have written what Bryan, Pollak and Schawbel wrote so I'm sure your very own millennial is headed in the best direction. Happy to report my millennial daughter has graduated with honors and is doing very well thinking like a boss, attitude is everything even if you have to fake it till you make it after all none of us knows anything until we are taught or learn by observation. katiem2, The millennial generation has a lot going for them! I have a millennial daughter, she is wonderful, smart, talented and hard working. I think there really is something to the whole generation gap. I always make certain to shift my train of thought. sandyspider, One of my favorite books is "Seeing Like a State." The perspective of putting oneself in other shoes will be sometimes shocking and always formative and elucidating. Valuable information to think like a boss. Will have to bookmark this for future reference.